If for whatever reason you choose not to use a Unity Candle during your ceremony, the Sand Ceremony can be a beautiful and meaningful addition to your vows. Simply find three containers, one for you and your fiancé to pour the sand into, two for each of you to pour the sand from. You can find colored or plain sand at most craft stores. After the Officiate reads the text below (or any text you choose) pour the two containers of sand into the third container simultaneously. You may wish to leave a small amount of sand in each container to symbolize that although you are now joined as one, you each remain individuals. 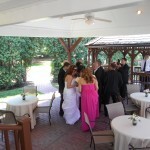 (Bride’s name) and (Groom’s name) You have committed here today to share the rest of your lives with each other. 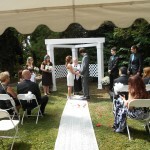 We have witnessed your giving and receiving of rings and the exchange of vows and a kiss. Now we will observe you create a lasting visual representation of these promises. The (insert color) sand represents (Bride’s name) and all that you were, all that you are, and all that you will ever be. The (insert color) sand represents (Groom’s name) and all that you were, all that you are, and all that you will ever be. Your relationship is symbolized through the pouring of these two individual containers of sand into one container. You will note that the individual colors do not cease to exist, but that there are times when the two are blended. It is this blending that is marriage. The (insert color) sand represents (Bride’s name) and all that you were, all that you are, and all that you will ever be. The (insert color) sand represents (Groom’s name) and all that you were, all that you are, and all that you will ever be. The third (insert color-usually white or gold) container represents God. (Minister pours the third container) Your spiritual beliefs are the foundation for your marriage. Bride, pour some of your sand which will represent you as an individual. Groom, pour some of your sand which will represent you as an individual. (Minister pours more of the third container) Let God forever support you in your relationship. (Bride’s name) and (Groom’s name), now pour your remaining sand into the container together to represent the joining of your two individual lives into this union of marriage. 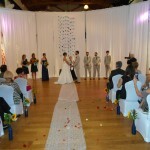 In this Unity Sand ceremony, you will create a lasting visual representation of the promises and intentions for you marriage. 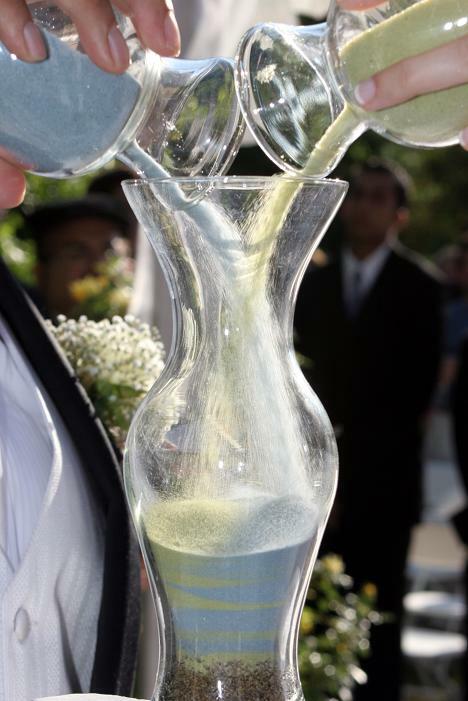 As I describe the various colors and their meanings, pour them into the container representing your marriage. Red represents a passion for life, physical energy and health. Orange shows sweetness, trust, and creativity. With yellow you bring in respect, personal power and spontaneity. Compassion, unconditional love, and balance are represented by green. Blue is the color of communication, contentedness, harmony and self expression. With Indigo you bring in intuition, wisdom, emotional intelligence and charisma. Violet represents peace, spirituality and selflessness. White is the color of purity and a connection with a Higher Power, God, Divine and Spirit. 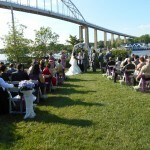 ___________________and ____________________have chosen to memorialize their commitment to each other and to their family with a Sand Ceremony. Each family member will pour a little of their sand into the container. You will notice that in spots the sand remains distinct because each person is an individual. The colors compliment and support each other, just the members of a family compliment and support each other. Now they will pour in the sand simultaneously. You will note how the colors blend. This is to demonstrate the unity of family, the togetherness, the blending of personalities, strengths and needs.